As the saying goes, every action has an equal reaction. 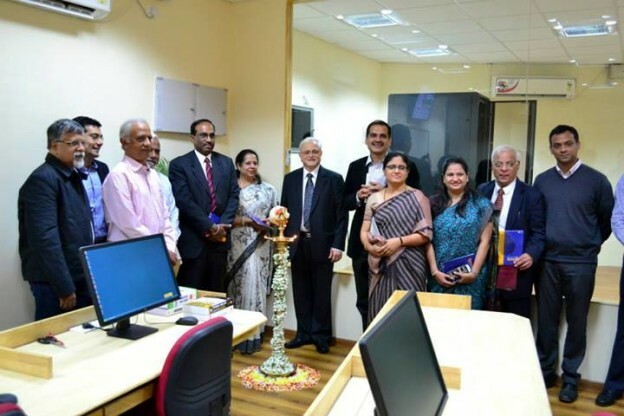 With the Prabhudas Lilladher Finance Lab at IFIM Business School sponsored by Prabhudas Lilladher, one of the India’s leading stock broking firms, it opens the door for every prospective student at IFIM Business School in enhancing and utilizing the services the lab is going to offer. This initiative will help students in acquiring the a great amount of financial knowledge with the help of the faculties. From the point of view of students, this lab will be helpful in providing sufficient amount of Live and Simulated Equity Trading, Futures and Options in equity, Currency and Commodities. It will also enrich student’s understanding of Technical Analysis and Fundamental Analysis which forms the basic price trend methods in the stock market. Further speaking on the learning aspect of this lab, there are 15 workstations which are purely dedicated to live trading. They are fully equipped with software for live and simulated trading, Fundamental and Technical Analysis, Information services, Portfolio Management etc. All these activities at Prabhudas Lilladher Finance Lab will be assisted by the Faculties at IFIM Business School and the members of Prabhudas Lilladher Group. As rightly pointed out by Mr. Dhiren Sheth, Vice Chairman and Joint Managing Director, Prabhudas Lilladher Group, it’s a constant effort by the group in spreading financial understanding among the student community for a safer and better trade. This will help students in learning the financial aspects before competing with the real financial world at corporate level. Under guidance and scrutiny of PL Group members and faculties, the students will be joining for a live trade with prior knowledge and understanding of the stock and capital market. This inauguration of Finance lab was also well supported by the members of the Team Alpha. Alpha is the Finance and Investment Club at IFIM Business School, a student’s initiative of bringing adequate financial learning experiences among the beneficiary student committee. With the help of Faculties, the inauguration was carried out. The success of this Finance Lab at IFIM Business School lies in the hands of the students, as it’s the student’s responsibility to utilize and benefit from the lab. We shouldn’t even forget the contribution of the Management of IFIM Business School in bringing up such an initiative for the better future prospectus of their students. Contributions by Management, Faculties and Students of IFIM Business School has been successfully rewarded by the outcome of this Finance Lab with well support of Prabhudas Lilladher Team. As Benjamin Franklin rightly said, “An investment in knowledge pays the best interest.” When it comes to investing, nothing will pay off more than educating yourself. Doing the necessary research, study and analysis before making any investment decisions will be the first and right stepping stone, which the Management of IFIM Business School has laid for the well-being of its students. This entry was posted in Events & Happenings, Finance on December 23, 2013 by IFIM Admin.